Day 1 of the Africa Investment Forum at the Sandton Convention Centre in Johannesburg. Nigeria's Vice President Yemi Osinbajo will depart Abuja on Wednesday to attend the Africa Investment Forum organised by the African Development Bank (AfDB), scheduled to hold at the Sandton Convention Centre in Johannesburg, South Africa. Dubbed by organizers of the event as the "collective deal of the century for investment in and the development of Africa," the forum will focus on advancing projects to bankable stages, raising capital and accelerating the financing of key projects and deals. 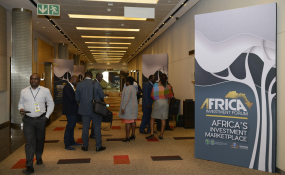 Organisers say the forum is aimed at attracting multi-billion-dollar deals across the continent and is set to usher in a new era for Africa's investment landscape. The Government of South Africa, the African Development Bank, and several multi-lateral development partners are hosting the Forum, a key springboard for investment in the continent expected to become an annual event. On Thursday, the Vice President will attend the official opening of the forum which will be closely followed by a plenary investment roundtable. Prof. Osinbajo will also participate, as a distinguished panelist, in the Presidential Investment Chat - one of the high-profile activities scheduled to feature at the forum. He will also participate in an exclusive event for Heads of State and a selection of business executives, on "moving forward Africa's private sector development", under the Chatham House Rules. Global financial institutions such as Africa Finance Corporation, Development Bank of South Africa, Africa 50, Afreximbank, European Investment Bank, Trade and Development Bank, and the Islamic Development Bank, have come together to form solid strategic alliances around this new investment forum. Acording to Mr. Laolu Akande, Senior Special Assistant to the President on Media & Publicity, Osinbajo is expected back in Abuja later on Thursday.